Well, Summer is officially here! Memorial Day weekend begins in a matter of hours ... grills will be fired up, pools will be packed, and families will be getting together to celebrate! The Indy 500 is also happening this weekend and in light of this American tradition, we want to show you how Google Apps runs laps around the competition with features that other legacy systems do not have! Do you ever have an email thread that starts at 9am and is replied to throughout the day? How many times have you needed to refer to an email in that conversation that was sent around 11am during your 3pm meeting? With Conversation Threading in Gmail, all of the emails that follow the original message are stacked together creating one flowing email message thread. One thing to note is that to keep these messages together, they need to have the same subject line in the message. This is beneficial because every time you open this message thread, you have the ability to catch up and review the messages so that your reply is in order and not out of context. Other email systems have the messages come in as separate emails which can be time consuming as you look for the specific message you need to reference. If you work in a distributed workforce environment, it can sometimes be challenging to get everyone together to work on an important document for a project. 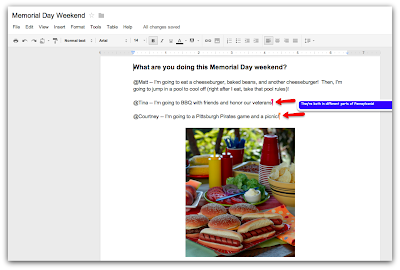 Simply open Google Docs --> Create a Doc --> Click on 'Share' in the upper right hand corner of the document --> Enter the email address of the person(s) you wish to share it with --> Begin to add information to the document. Depending on how many people you have shared the document with, you'll see them appear in the document adding the information they key in. You can also add comments, chat within the document, and come & go as you please. Each keystroke is saved as it is typed in! 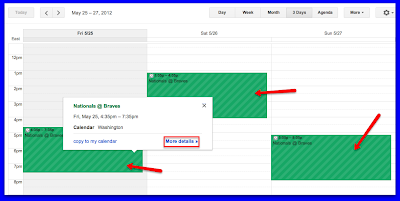 To begin following your favorite baseball team, simply open your Google Calendar --> Click on the drop down arrow next to 'Other Calendars' --> Click on 'Browse Interesting Calendars' --> Select 'Sports' --> Select 'Baseball' and then select 'Major League Baseball MLB' --> Locate your home team and click 'Subscribe' to the right of the team name. Now, the calendar for your favorite baseball team will appear in your 'Other Calendars' list. This calendar will display all the games that will be played throughout the season. For additional information about the game, click directly on the event and click 'More Details' to find out what TV station it's being shown on and inning by inning scoring stats! These are just a few features that put Google Apps ahead of the pack. Please let us know of any features you've found valuable in Google Apps the are not available in other email systems in the comments section below. Also, please give this post a +1 if you found it fun and informative ... others can benefit from this post as well. Have a safe and happy Memorial Day weekend!! !